We usually focus on the adults when we talk about stress but research shows that children also experience stress from both external and internal factors. Pressures of technology, computer gaming, exam results, hormonal changes and changes in family settings can initiate the flight or fight response which we refer to as ‘acute stress’. The difference between adults and children is that (in most cases) adults know how to take steps to address their stress symptoms, express their emotions and calm their minds. In the case of children to teens, this may not always be the case and, if not addressed, acute stress can lead to chronic stress symptoms. If you are thinking about teaching your children some of these simple techniques, here are a few suggestions to help you get started. First of all – ensure that you are in a calm state. Children tend to reflect the mood and energy of those adults around them and can act like little mirrors if you are in a bad mood. If you are calm, they are in a better position to mirror that. Using the senses (touch, sight, taste, smell or sound), encourage your children and teens to choose one of these and focus on it fully during a normal daily activity like eating, drinking or walking. They tend to enjoy learning to relax when they are lying down in bed and it is an easier way for the adult to introduce the idea of relaxing with the breath and the body when they are in this natural position. Instead of just calling it ‘meditation’, for younger children call it a ‘meditation game’ – the latter word will encourage more enthusiasm and interest. Then you can use their imagination to create a favourite place they can imagine being in with or without their friends. Mindfulness meditation is a good way to engage this age group, by giving them simple words to meditate with. These can be as simple as ‘just for this moment I will not worry/be angry’ to the more Buddhist approach of [breathing in] ‘my body is like a mountain, [breathing out] ‘my body is strong’. 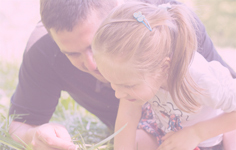 The Connected KidsTM programme is based on the international best selling booking – ‘Calm Kids – help children relax with mindful activities’ by Lorraine E Murray. Lorraine has been teaching meditation for over 10 years whilst studying the effects on all age groups. 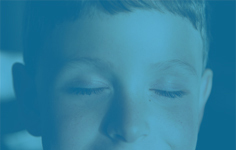 Connected KidsTM now offers online and in-person training (worldwide) for parents or adults working with children – teaching them how to help children learn meditation. Lorraine’s 2nd book (Connected Kids) illustrates how teaching meditation to kids can help children on the autistic spectrum, with ADHD or other special needs. We have a large number of teachers on our courses and one of the things that people want to know is how to incorporate meditation and mindfulness into what is already a busy day. Here are a few tips on how to do this to help you get started. 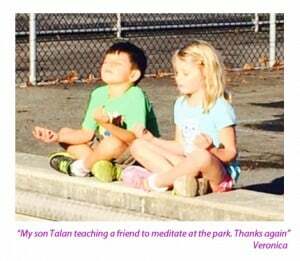 One of the first things I ask people who want to teach kids meditation is “do you meditate regularly”? So do you? If not, why not? If you practise some simple mindful breathing, it will help you to cope with times of stress in the class room. It may seem that the children aren’t being affected directly, but they are. Their energy picks up on your stress, so if you practise mindful meditation on a regular basis, it will help you feel more grounded and able to cope in a busy class room. Our expectation of meditation is that it has to be a long period of time to get any benefit. Not so. If we sit noticing our breath for a minute, this gives our mind, body and emotions the opportunity to come back into balance with each other. In my book ‘Calm Kids’ I describe different breath techniques that you can use to engage children in noticing the breath. For those with a very short attention span, ask them to hold their hands in front of their face, eyes closed and to feel their breath on their hands for 1 minute. This helps them to focus, feel their breath and slow down. No-one likes to do something that isn’t interesting, eg it is boring! So why should meditation be any different? If they have a particular interest in a comic strip hero or a toy, then make the meditation about an imaginary journey with them. For children (sometimes with Autism) who find it difficult to use guided imagery in a meditation, then using tactile objects can help. 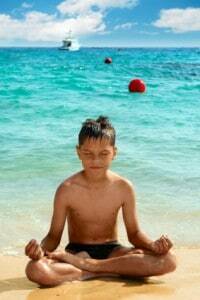 If your meditation is about a seaside trip then take in seaweed, sand, salt water, a seagull feather or a shell to help engage them. I explain this in more detail in my book ‘Connected Kids’. Get the children to help design a notice for the class room (or a corner of the room) that helps others know this is where they want to meditate and not to be disturbed when they are practising. I was visiting a friend the other day who was travelling to Australia with their baby daughter and who was concerned (naturally) about the long flight from the UK and how she would cope. This prompted me to share a few ideas that might help you if you are worried about travelling and how we can bring in mindfulness and meditation to help ease some of the journey woes. Focussing on the breath – many of us know how powerful the breath is. However it’s important to help your children learn about the breath to help them feel calmer. Feeling the breath (placing hands on the tummy or chest), counting the breath and even making a sound on the out breath all help children to focus on the breath and be in the moment. 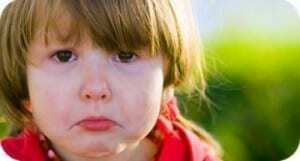 If children are feeling nauseous we can even combine a word with the breath to help. Place their hands on their tummy and ask them to focus on their tummy with the breath and think/breathe the word ‘calm’. The colour breath is a great one to use anywhere! In my book. ‘Calm Kids’ there’s more information about how to do this. Ask them to think of a colour, surround themselves in it and breath it in. Remind them that the colour is calm, peaceful, cool or whatever quality you feel they need. Using the Imagination – in such busy places as airports it’s a great idea to get kids to imagine that they have a special ‘gold’ spacesuit that they wear in busy places. The special spacesuit helps keep them safe and it helps them cut out all the noise and stress (this is especially great for kids with autism). 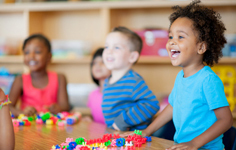 Sound – The alternative is to get children to focus on a sound – it could be the sound of a car, or the sound of the wind or even on the sound of the plain taking of so that their mind is on this and not anything else (for those few moments). Meditation ‘Games’ – If they don’t want to do the colour breath, you could always ask them to choose a colour and notice it outside. Pick really unusual colours to see. We turned this into a game with our nephew – we all had to pick a colour and on the motorway we counted the cars of our colour and whoever reached 25 first won! Listening to a meditation CD – this is a useful option too so you can have it on your mp3 player or ipod and they can spend time with their eyes closed just enjoying an imaginative journey. (You can find more of our children’s meditation CDs here). Special Travel Stone/Crystal – whether or not you believe that crystals work, they are a tangible way to give our children a ‘worry stone’. They can breath into it with their stress, they can hold it to their tummy or chest and breath in the crystal’s calmness, or they can simply play with it in their hands. Mandalas – although these are primarily used as meditation tools, colouring in a mandala brings an opportunity for focussed attention and the energy of the mandalas can help children to feel quieter and safer (free mandalas on this link). Storytelling – ask your children to teach you a meditation. Call it story telling if this helps them to understand what you want them to do. It helps them to use their imagination. Labyrinths – these are also a great way to keep children focussed – using a pen to follow their way into the labyrinth then following it back out. You can find a free labyrinth design to print here. Make it a ‘contest’ to see who can be the slowest to complete it! Have a Travel Toolbag – be prepared for your journey and don’t expect one mindful activity to be the answer for the whole journey. Have lots of options ready to use for your kids, and you. Calm Adults, Calm Kids – travelling is as stressful for children as it is for adults (and often kids pick up on the stress parents feel). So make sure you are grounded and centred first (focus on your breath to help with this and think “calm”). The more you can do to feel calmer, the more your kids will reflect this. They are the mirrors of your energy.